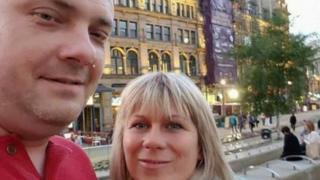 A Polish couple living in York who had gone to Manchester Arena to pick up their daughters have been killed in the terror attack. Angelika and Marcin Klis had not been seen since the explosion at the Ariana Grande concert on Monday night. The couple's daughter Alex Klis, 20, a student at York College, had posted an appeal on Facebook for information about their whereabouts. The Polish foreign ministry confirmed two Polish nationals had been killed. It is understood Mr Klis, 42, worked at York Cars Taxi Service, a cab company in York. Mr Klis and his wife, aged 39, had taken a picture of themselves together in Manchester shortly before going to the concert to collect their daughters. This was shared on social media by their daughter on Tuesday. She wrote: "Anyone who is in any safe place or hospital in Manchester, if anyone comes across my parents please please let me know as they've been missing ever since the attack, this is a picture taken tonight so this is exactly what they were wearing." In a statement, the Polish foreign ministry said: "We share the pain of the family and the loved ones of the victims and express our most sincere condolences. "Consuls have offered assistance to the family of the victims." The Polish Foreign Minister, Witold Waszczykowski, told a radio station: "The parents came after the concert to collect their daughters and unfortunately we have information that they are dead. The children are safe." Dr Alison Birkinshaw, principal at York College, described the deaths as "devastating news for Alex and her family, the whole college and the wider community". She said: "We are in touch with Alex and will do whatever we can to support her and her family." A JustGiving page has been set up to raise money for Ms Klis and her sister Patrycia and has so far raised more than £4,000.